On 29th and 30th September Cotswold Airport is throwing open its gates to the public once again for its incredible vintage and wartime extravaganza, the event last year saw the inaugural launch of this hugely popular event which started out as an informal fundraising open day for 500 people and ended up as a major event with over 10,000 visitors. We are really excited at Mike-Buss.com to be linking up with the Cotswold Airport Revival Festival this year to give away a family ticket to this magnificent event. The event this year will be a two-day event, and is set to be an absolutely unforgettable weekend with lots of exciting activities and attractions for all the family. 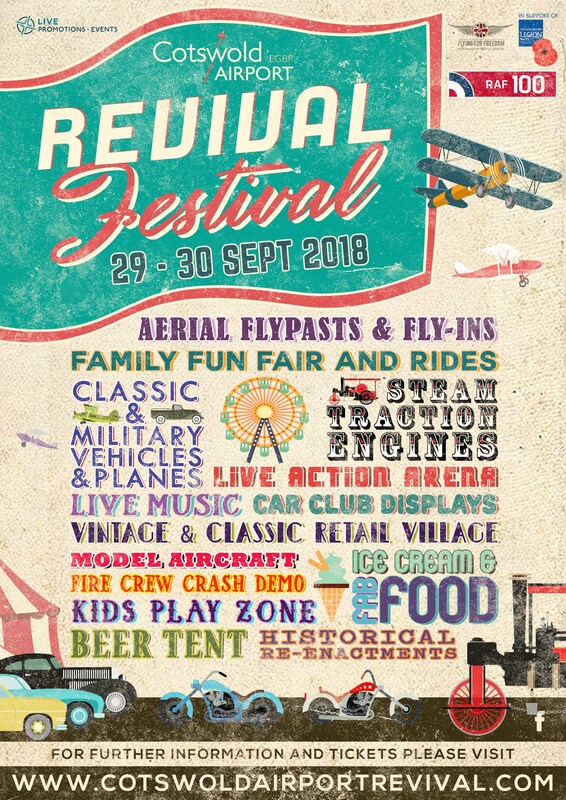 Both days will be packed full of dramatic re-enactments and demonstrations; thrilling vintage air fly-ins; exciting rides and experience flights; hundreds of vintage and military vehicles; full size and miniature steam engines; and plenty of entertainment including period live music. Follow both Cotswold Airport & Mike Buss on social media, follow/like on facebook, twitter or instagram and share the competition post/tweet on facebook or twitter. Winner will be announced 1st September.